It has been an unusually rainy couple of weeks here in the Bay Area. According to SFGate.com, the rain is likely to continue this weekend and all next week with the forecast including a soggy Christmas Day. While we all know that we need the rain, that doesn’t make it easy to get through a long stretch of wet weather. The frequent rains also make for difficult driving and, because prevention is always the best option, our San Francisco car accident law firm wants people to stay alert for the possibility of hydroplaning and related accidents. For at least one family, the threat of a wet weather accident became all too real recently. NBC Bay Area reports that an accident on eastbound Interstate 580 near West Grant Line Road claimed two lives on Sunday December 13. Officials suspect that the single-car accident, which occurred in the vicinity of the Altamont Pass, began when the vehicle hydroplaned on a pool of water. The vehicle then rolled repeatedly before coming to a stop down an embankment. The two adults in the car were pronounced dead at the scene while their children, ages 5 and 6, were taken to an area hospital with one reportedly suffering traumatic injuries. Clearly, hydroplaning is a serious matter, but what exactly is it and how can you prevent it? 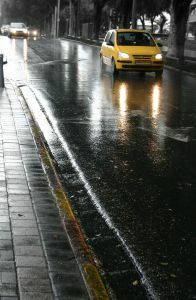 SafeMotorist.com, a private organization dedicated to educating drivees, explains that hydroplaning refers to a situation where a car’s tires skid or slide across a wet surface. Tires have grooves (aka “treads”) that are supposed to channel water away from under the tire, ensuring contact with the road and the friction that provides control. The problem arises when a tire encounters more water than it can effectively scatter. Water pressure pushes water underneath the tire, causing the tire to lose contact with the road as a film of water separates the tire and the road surface. As a result, the driver loses traction which in turn causes a loss of braking, steering, and control. Any wet road can give rise to hydroplaning. It may, however, surprise some readers to learn the greatest risk is often during the first 10 minutes of a light rainfall. Light rain and the oil residue found on the road’s surface mix, creating a higher risk of hydroplaning especially for vehicles travelling faster than 35mph. It is the slick conditions that drivers may not expect that can really raise the risk of a car accident. When possible, avoid sharp and/or quick turns. It is important to remember that just because weather was a factor does not mean a driver was not negligent in contributing to a crash. Drivers are expected to know the law and to react appropriately to changes circumstances. If another driver caused a wet weather crash that injured you or someone you love, call our injury law firm in Oakland, Santa Rosa, or San Francisco to learn about your rights.